What are the best Pillows for Stomach Sleepers? Choosing the right pillow is just as crucial as a good mattress if you want to have a great night’s rest. Some think that what matters is the surface you lie on, but what many people don’t know is that the head and neck support is also important if you want to wake up feeling refreshed, with no tight spots around the neck whatsoever. The pillow is one of the essentials when going to bed because it provides comfort. But if you pick the wrong one, depending on the position you sleep in, you might wake up feeling sores. If you are a stomach sleeper, there are certain pillows that are recommended for you. Discussed here are the best pillows for stomach sleepers. What is the recommended pillow for stomach sleepers? The sleeping position definitely matters when looking for the best pillow that can make us feel refreshed and rested when we wake. If you are a stomach sleeper in particular, what you need is a pillow with soft support. This type of support should not turn the head unnaturally to either side. Just imagine sleeping on your stomach using a hard pillow. The foundation where your neck rests is too hard and since you’ll be either on your right or left cheek, the chances are high that you’ll wake up with a stiff neck on either side. Stomach sleepers are the ones most prone to get sores around the neck muscles because their heads are positioned quite awkwardly for hours at a time. Natural Fill – This is the one to pick if you want your head to rest on something soft. The fill for these are usually down or down-feather blends. These are expensive, though. If you are in a tight budget, a good replacement for feathers is a poly-cluster fill. Synthetic Fill – This is good for people who want a soft pillow but still has a bit of support and resistance. It’s almost as similar as down but the filler used is a bit packed and firmer so you’ll get more support. Memory Foam Fill – This is good for people who experience discomfort due to lack of support. Pillows filled with memory foam feel extremely supportive and a bit dense, but it doesn’t hurt your neck as it conforms to the shape of your neck. They are a bit expensive though and are prone to soften a bit over time. Key Takeaway: For stomach sleepers, opt for soft pillows that has natural or synthetic fill. This won’t hurt your neck even if you sleep one either cheek all night. It’s also naturally good for the face and neck, as it doesn’t give too much support and pressure. What are the best pillow brands for stomach sleepers? This pillow is the best that you can get if you are a stomach sleeper because it is made especially for that purpose. 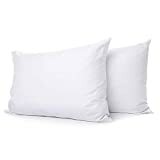 It is filled with white duck down that is enclosed in soft and hypoallergenic 100% cotton with 250-thread count. You can machine wash and dry this pillow without worrying about fraying. The down is at 70% and although it is very soft, this pillow is not flat. It only comes in one size, which is standard (20 x 26). Despite long usage and extreme sweating, this pillow doesn’t sustain odors, provided that you’re in a well-ventilated space. The only con might be this pillow is too soft that you can easily squish it into a ball. This is not recommended if you want to have a little bit of support. PILLOW SUPPORT / POSITION: Medium density ; Great for Stomach & Back Sleepers. FABRIC: 300 thread count, 100% cotton with AllerRest FabricBarrier Weave - Specially woven to prevent down & feathers from sneaking out. DESIGN: Pillow-in-a-pillow design, Double needle stitched edge for durability, Navy blue cording. This pillow is very luxurious; It has hyperclean 95% natural duck feather and 5% natural duck down fill. 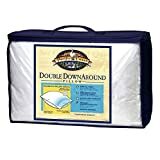 The feather and down are enclosed in a cover made from 100% cotton with 300-thread count. It also has a unique pillow-in-pillow construction for more durability and features AllerRest Fabric prevents dust, dirt, and allergen exposure. It can fit beds of all sizes as it comes in three size options: Standard, Queen, and King. It has a 1.5” gusset that makes the pillow fluffy up to the edges, which is good for stomach sleepers. Also, for this affordable price, you’ll get a pillow that is almost equivalent to the high quality ones used in five star hotels. For your convenience, it can be machine washed and dried. Bamboo Material Fill - Our bed pillow filled with Premium Bamboo & Polyester blend fiber which makes the pillows hypoallergenic and ventilation. This is a good option if you don’t want to have a down or feather filled pillow. This one is filled with hollow, siliconized, polyester cluster fiber that are very soft and recommended for people who are stomach sleepers. It is hypoallergenic and is housed in a 200-thread count 100% cotton. This pillow is recommended for being fluffy after being used and washed for years. Other continuous filament fiber flattens out quickly or becomes lumpy when washed but this one maintains its shape because of its much loftier cluster fiber. It averages a lifetime of 3-5 years. For the price, you’ll get two quality pillows that don’t get squished very easily. This is good for people who want to have a little bit of head support. 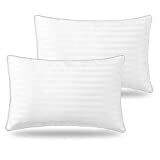 Finding the best pillow for stomach sleepers is not that difficult because a lot of companies make very soft ones, as it is the norm for pillows to be soft and even cloud-like. Manufacturers only deviate from this when they have to create pillows that cater to the wants and needs of people, such as those looking for more support and stiffness. For stomach sleepers who look for soft pillows that won’t put strain on their necks, you surely won’t have trouble picking one.